Lake Texoma elevation is 616.07 and water temperature is 47-49 degrees. 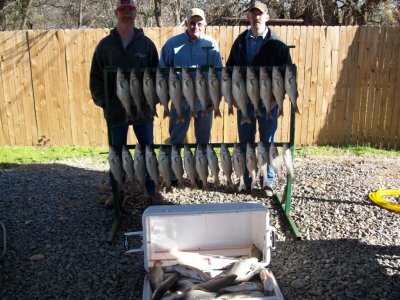 OurLake Texoma striper fishing continues to improve daily. I fished several trips the week before Christmas and into this week and the striper fishing is probably at it's best right now. With the cold weather settling in and these fast fronts blowing thru the stripers are on their winter feed and really chunking up. I have mainly fished west of Highport using live bait and the depths have varied almost daily but mainly the 25-50 ft of water.